Elias Green is located at Elias Road near the beautiful Elias Park and Changi Beach. If you are a biker, the Tampines Mountain Biking Trail is right across the condominium. Elias Green is accessible via the nearby expressways - Pan Island Expressway (PIE), Tampines Expressway (TPE) and East Coast Parkway (ECP). It takes only 5 minutes or less to commute to the Changi Airport. It is about 10 minutes to the nearest Pasir Ris MRT station. Nearby amenities include Elias Mall, White Sands, Tampines Mall, Pasir Ris West Plaza, Century Square, Downtown-East Resort, The Japanese School Tanah Merah & Laguna Golf and Country Club. Quiet and cosy condo living and most popular among expatriate due to large size units and spacious common space and greenery landscape. 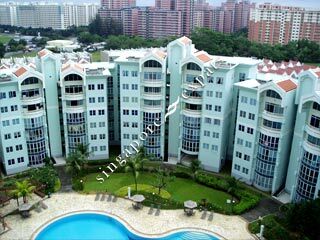 Its lovely spacious condominium. The rooms are huge. Very airy and bright. Even the common bedrooms are very spacious and comes with attached bath. Lovely condo facilities like squash court, basket ball court, and sauna very hard to find in other condos. All the amenities are nearby and excellent condo bus timings. Very Spacious condo with lots of outdoor space. Large units. Several schools, Escape theme park, Wild Wild Wet.